Like all of us, Bauerle weighs cost, convenience and personal values in deciding how she’ll travel to work. 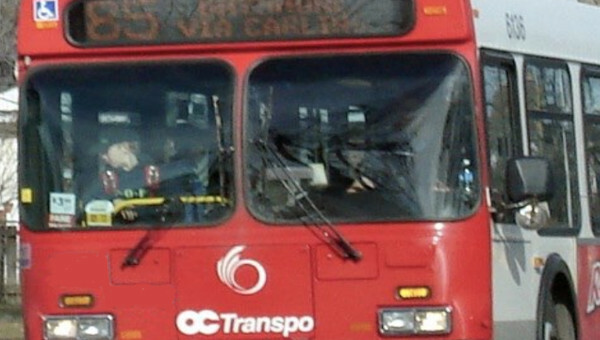 She says the two-bus trip can take as much 20 to 30 minutes longer than driving. That time difference would matter less to Bauerle if she wasn’t paying for the bus out of pocket, but the cost plus time has her grabbing the car keys most mornings, joining the roughly 34 per cent of University of Washington employees who drive alone. 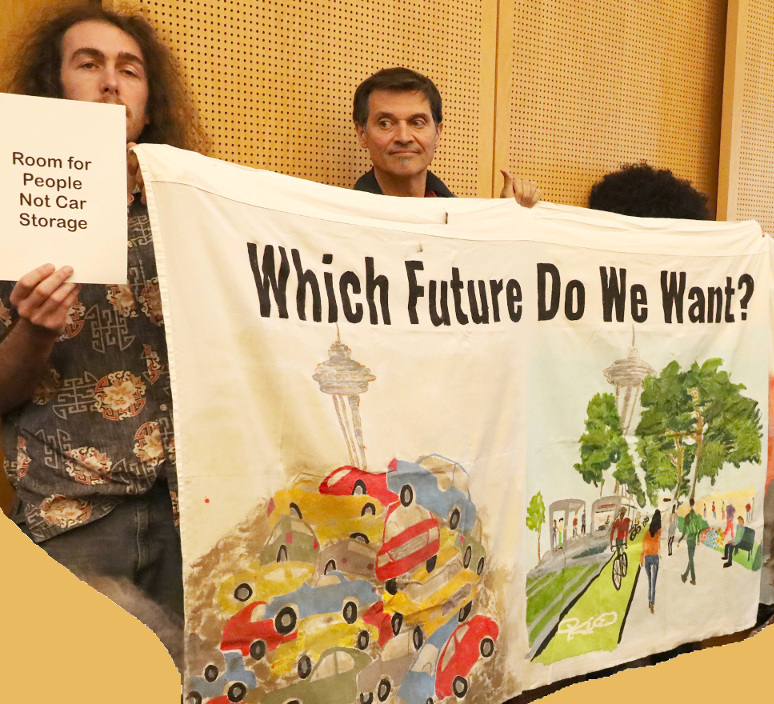 Activists in favour of less car parking are on hand at the Seattle City Council meeting. Bauerle is part of a campaign to try and change that equation for employees like herself. UW Pass or Fail – a new campaign lead by a broad coalition including university employees, the Seattle Transit Riders Union, 350 Seattle, SEIU Local 925 and others – is pushing the University of Washington (UW) to fully cover the cost of transit passes. 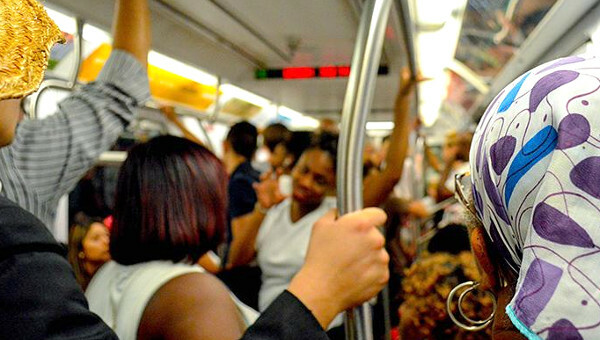 Currently, university faculty and staff can get an unlimited transit pass for $50 a month. Though that’s nearly half the normal $99 cost for an unlimited monthly regional transit pass, the campaign argues that as a state employer with tens of thousands of employees, the University of Washington is lagging behind other state employers, Seattle universities, hospitals and large companies that provide employees with free transit passes. “It is actually cheaper in the long run for [the university] to make transit free for employees than building more parking,” said Rosalie Ray, a Columbia University PhD student and contributing author of Free Public Transit: And Why We Don’t Pay to Ride Elevators , at a May 21 launch party in Seattle for the newly published book. Co-edited by Jason Prince, an urban planner and faculty member at Montreal’s Concordia University, and Judith Dellheim, a researcher at the Rosa Luxemburg Foundation in Berlin, the new book comprises 19 wonky, academic essays from a variety of contributing authors. 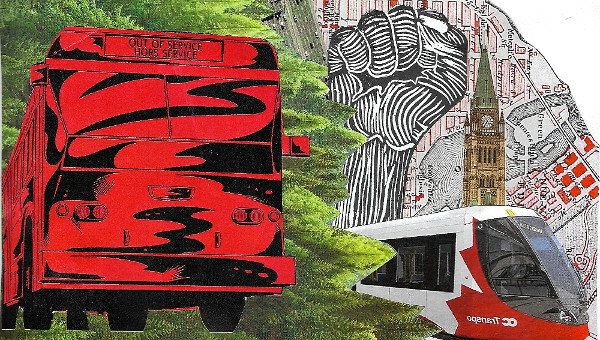 The anthology makes a collective economic, environmental and social justice case for fare-free public transit and looks at case studies from cities around the world that have implemented free transit policies. Most of the fare-free systems are in Europe, with 21 in Poland, 20 in France and another 15 elsewhere. Estonia’s capital Tallinn, home to about 450,000 people, is the largest city in the world with a fully fare-free transit system. [Since then, “Estonia To Become The World’s First Free Public Transport Nation.”] Perhaps surprisingly, the United States has 27 fare-free systems – mostly in small towns and colleges where the cost of fare collection out paces the revenue it raises. There are also 11 fare-free systems in Brazil, two in China and one in Australia. Globally, transportation is responsible for more than 22 per cent of greenhouse gas emissions; meanwhile, transportation is often the second highest household cost. Prince points out that fare-free transit could help incentivize single occupancy vehicle drivers to shift to more environmentally friendly buses or trains and help ease financial strain for low-income households. It turns out, cities have long made the link between air pollution and encouraging transit use by making it free. The book references a few examples, like in April 1973, overwhelmed by daily traffic jams and the pollution it caused, Bologna, Italy (then under communist rule) made buses free before 9 a.m. and from 4:30 p.m. to 8 p.m. Recognizing that free buses alone would do no good if they were stuck in traffic, the city also implemented restrictions on 75 per cent of their streets such as bus and taxi only zones, streets only accessible by businesses and delivery drivers, and pedestrian only streets. After two years, the policy reduced daily traffic from 200,000 to 160,000 cars. Many fare-free transit systems are introduced in service of economic development – think free downtown circulator buses and street cars. Tallinn, Estonia’s fare-free policy was originally introduced in 2012 in the wake of financial crisis. 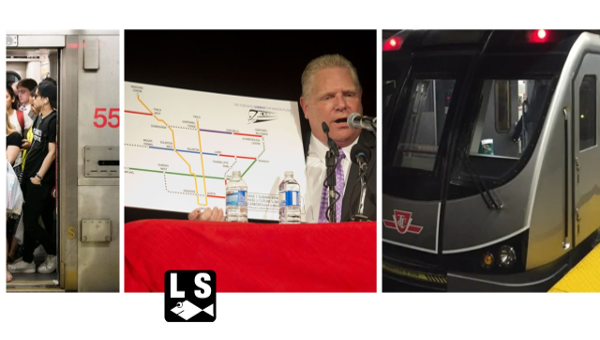 Residents could not afford the fare and the government was already subsidizing 70 per cent of the system cost. Rather than slashing service, they eliminated the fare. City leaders assumed it would help stimulate the economy some. They were surprised to discover people moved to the city in part to take advantage of the service and the increased tax base more than offset the lost fare revenue. The final chapter of the book argues that cities should consider using land value capture to fund transit – the idea of capturing some of the increase in land values around transit systems and stations as a way to pay for transit. Because transit systems and stations raise the value of adjacent properties, the author Jan Scheurer, says it makes sense to tax those landowners on their increased wealth to pay for transit service. This article first published on the NextCity.org website. Josh Cohen is a freelance writer in Seattle, covering transportation, housing, and environment. His work has also appeared in The Guardian , The Nation , Pacific Standard and Vice . Follow Josh @jcohenwrites.